First and foremost, everyone is going to ask the question, why would anyone buy a film camera in this almost entirely digital age? I am not going to go into the film vs. digital debate here; instead, I would like to mention some of the factors that make the F6 a worthy purchase. Film is a medium into itself that has its own and unique character. As time goes by, people will also realise that in terms of image quality it is not nearly as bad as they think it is. 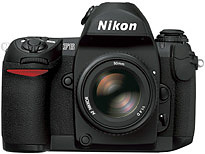 Overall built (and image) quality, ergonomics and set of features of the F6 represent a far greater value for the money than any current (early 2005) Nikon DSLR under USD4000. Superb reliability due to a far lesser dependence on all kinds of supplementary electronic devices as well as in rough weather conditions. Your super wide–angle lenses are still super wide. In the long run, an F6 with your existing super wide–angle lenses might prove a better wide–angle alternative than an investment into DX lenses (the F6 can serve as a very reliable backup body, too). In case of some specialty lenses (e.g., 28mm f/3.5 PC Nikkor AI–S), a full frame body is the only wide–angle alternative. In some wedding photography markets (e.g., Vancouver, Japan) film still rules. The F6 is, obviously, to stay and, unlike current DLSRs, will not become obsolete for quite a few years. While its price will decline insignificantly over the years, I believe we will not see any drastic changes as, say, in case of the D2H when its price dropped overnight from over USD3000 to under USD2000. Put differently, I can afford an F6 but I cannot afford participating in the digital race. And if for all of the above purposes/reasons you already own an F100 or an F5, read further! The F6 is rather evolutionary than revolutionary. To cut a long story short, it brings to perfection almost all * the things that, on the one hand, are not entirely crucial if compared with the F5 and the F100, yet, on the other hand, do bother you in the F6's predecessors every now and then. It is like you have a wife you love and are almost perfectly happy with but, just at times, you kind of think, if only she smiled more and talked less... paradise on earth... you get the picture. Well, with the F6 all those "only if" come true (unless, of course, you want your wife to go digital, which is a totally different deal :)). And this is not all—this latest incarnation of Nikon F series cameras comes with several nice surprises thrown in on top. Nikon F6's English Manual can be downloaded here. The F100 really shines in these areas and the F6 takes it even further. The camera's design most certainly represents a masterpiece—the longer you look at the camera the more it grows on you how uncluttered and consistent the design is. I personally very much welcome Nikon's decision to go back to the separate vertical grip design—the bulk of the F5 was one of the main reasons why I never bought the camera. The F6 is slightly heavier (975g vs. 785g—without batteries; with batteries the difference is even less noticeable) and has a higher profile than the F100; however, added weight and bulk contribute to the overall perception of better ergonomics only. The body feels extremely well balanced with both small–sized (e.g., AF Nikkor 50mm f/1.4D) and relatively big–sized (e.g., AF–S VR Zoom–Nikkor 70–200mm f/2.8G ED–IF) lenses. If you look at the camera from below, the outer part of the handgrip is now less round and sticks out a bit further, which allows a much firmer grip. AE/AF–L and AF–ON buttons have been offset slightly. On the one hand, you can distinguish between them without looking more easily; on the other hand, the AE/AF–L button is now much more readily reachable than on the F100. Command dials operation is noticeably smoother. Sub–command dial is angled upwards. Film advance mode selector lock release has been moved further away and down from the film advance mode selector, thus making operation of the selector less awkward than on the F100. Top panel and viewfinder displays are better laid out and reading information is much more intuitive. This is especially true in case of the viewfinder display—it is much less cluttered now that the analog exposure bar as well as exposure compensation and bracketing indicators have been moved to the right. Bracketing and exposure compensation indication has now been entirely separated. On the F100, "+/-" is shown (but does not blink) and an "o" blinks if you apply exposure compensation; "+/-" blinks and a "BKT" is shown when you use bracketing. And if you employ bracketing and exposure compensation at the same time, exposure compensation is not reflected on the LCD in any way. Now, this is not an entirely logical way of denoting the functions—in fact, it is very confusing. With the F6 this confusion has been resolved: "+/-" strictly means exposure compensation. Moreover, when you simultaneously use exposure compensation and bracketing, the analog exposure bar (on the top panel LCD and in the viewfinder) directly shows combined effect. Setting bracketing (up to seven frames) parameters is much more straightforward, too. On the F100, main command dial is used to only turn bracketing on and off, whereas sub–command dial is used to choose both EV stops (e.g. 0.3, 0.7 or 1) and number of shots. While you can set bracketing parameters in the same way on the F6, the pre–set option is to use the sub–command dial to set EV stops (which is immediately reflected on the analog exposure bar) and employ the main–command dial to turn bracketing on/off and set number of exposures. (Hint: turn the main–command dial right if you want to set bracketing to the "+, 0, -" mode; turn the dial left if you want to set it to the "0, +" or "0, -" mode.) This, again, is much more intuitive. Thanks to the protective rubber plugs permanently attached to the left strap eyelet, no more loosing and replacing the 10–pin and sync terminal caps. Film leader can be set to remain outside the film cartridge when it is rewound. I remember missing this function quite a few times on the F100. Data imprinting is possible (in–frame, between–frame, no. 0 frame)—my little travel notebook is not going to be exactly retiring but it is bound to see the light more seldom. Steps of exposure values (1/3, 1/2 or 1) now can be set separately for actual exposure (shutter speed and aperture) and exposure compensation. Mirror lock–up operates much more conveniently and flexibly than on the F5 (it works in all exposure modes, i.e. A, S, P and M and one does not have to switch everything to manual anymore). The number of multiple exposures must be set in the shooting menu and, very importantly, once it has been taken, the film automatically advances to the next frame and multiple exposure is canceled. This means no more mistakenly exposing the same frame until you realize that the current roll of film must have been finished half a year ago . Nikon and F6 logo on the front of the camera are embossed and painted rather than just stenciled, making the camera look even more refined. Mechanical film rewind crank has been retained. This in fact means that you can rewind film manually. Oh, is not this obvious? Well, try using film advance lever on the Epson RD–1 in the old–fashioned way ! There, of course, is a whole lot of other improvements that generally make things easier, handier and more straightforward. Probably the only controversial design decision that some photographers will moan about is the lack of the removable pentaprism. Now, what was this decision based upon? Considering the fact that Nikon is as conservative a company as photo equipment producers get, I reckon that there had been way too few users of the F5's alternative prisms to justify the removable prism design. As you will read in the whining part towards the end of the review, viewfinder, generally, has been a bit downgraded. If you used an F5 or an F100 before, you will find most of the controls of the F6 very obvious and instinctive. Autofocus, along with the new menu system, are the only areas where you will have to do some figuring and learning. In my view, the most significant improvement in autofocus system is not its speed and reliability—of course it is blissfully fast and dependable—but rather the number of sensors and their positioning. Five sensors and their layout in the F5 and the F100 make composition quite difficult as the sensors are not located where your main subject normally falls. Eleven sensors of the F6 offer a far wider coverage; also quite importantly, four sensors are located in the rule of thirds intersection points. The F6 offers more autofocus options, too. Once you get past figuring what they are and how they work, their overall classification and indication actually appear more logical than in the F6's predecessors. Thank God gone are the old–fashioned encrypted custom settings! Instead of them we get a new Menu System that is accessible via a large rear panel LCD screen. At first, it still seems that one has to do some deciphering here but once you go through it several times, most of the things become more or less clear. I am sure that with time one should be able to use most of the custom settings and shooting menu without having to carry a cheat–sheet (that actually is not provided). This is to say that while the new menu is a huge improvement over the old encrypted system, it still needs some work. Fonts are not entirely consistent and the interface, generally, is not exactly pretty—it would probably better suit a piece of military equipment than a user–friendly camera. Or are we all soldiers of the Nikon army ? To be honest, I do not think we should expect any breaking news here. As before, three modes are available—matrix, center–weighted and spot. The F5 already offers nearly perfect Matrix metering and while it would be unreasonable to expect less from the F6 (Nikon does claim that the camera's matrix metering has been improved), it probably would be difficult to make a major break–through here, too. The only area where I would reserve judgment for now is how well it works with the new i–TTL system. As with the F5, center–weighted metering offers the flexibility of changing the diameter of the area of meter's sensitivity between 8, 12 (pre–set), 15 and 20mm; alternatively, you can use an average reading of the entire viewfinder. Despite the numerous custom functions, one function that I really appreciated having in the F100 cannot be found in the F6. That is the option of having LCD illuminator activated by pressing any button. I found this feature especially useful when photographing sunrises and sunsets. What were Nikon engineers thinking getting rid of it? Viewfinder could probably be better. Nikon F5: 100% coverage, 0.75 magnification, 20.5mm eyepoint; Nikon F6: 100% coverage, 0.74 magnification, 18mm eyepoint. Even F100's eyepoint is 21mm (96% coverage, though). Overall, being so used to my F100 I feel a bit strained looking through the F6's viewfinder. Not that I cannot live with this, though. Related to the above point, built–in diopter adjustment goes only from –2.0 to +1.0 (the F100 offers a range of –3.0 to +1.0). I personally need –2.5. I know that this can be resolved by using optional accessory DK–17C, but what a pain! As mentioned above, the menu system needs to be further improved. If I am pressed to describe the F6's character in one word, –refinement– would be it. It gets to a degree where perfection of the means plays as important a role as the ultimate purpose does. Furthermore, this excellence starts having a life of its own. Granted, Nikon F5 and Nikon F100 are fully capable cameras and the question that many Nikon F5 and/or F100 users are going to ponder is whether all the new features of the F6 are worth the upgrade. Unfortunately, this question has to be answered by each photographer according to his particular circumstances. Keep in mind, though, that if you answer "no", the question will keep eating you up infinitely . Nikon F6 is the only film camera fully compatible with the Nikon Creative Lighting System (CLS) and utilising all functions of the Nikon SB–800 and SB–600 speedlights. The system works so brilliantly that it should be enough of a reason for photographers extensively using flash and shooting film to upgrade. After having used the camera for some time I find the new autofocus system truly liberating and a huge advantage. I especially appreciate the group autofocus, which allows me to loosely position the subject where I want it to be in the frame and then entirely forget about autofocus. My experience has been that battery life claimed by the camera's manual is a bit too optimistic (especially in cold temperatures). With first four pairs of 3V lithium batteries (Panasonic and Sanyo) I shot twenty nine rolls of film (only three rolls in sub–zero temperatures; majority of the rest in relatively cold but above zero temperatures). After that I lost count but my experience has been consistent with previous findings and I do not feel comfortable unless I have at least two spare sets of batteries with me. How does one use mirror lock–up and self–timer at the same time? This might sound like a joke but, seriously, the question occurred to me when I did need to use the functions simultaneously.